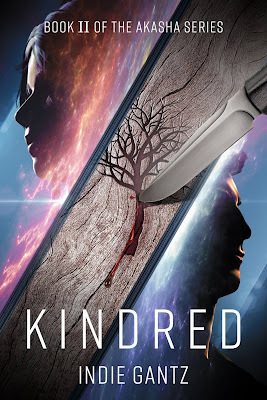 YA Bound Book Tours: Blog Tour Kick-Off: Kindred (The Akasha Series #2) by Indie Gantz! Blog Tour Kick-Off: Kindred (The Akasha Series #2) by Indie Gantz! 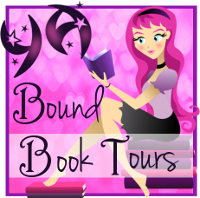 YA Bound Book Tours is organizing a Blog Tour for: Kindred (The Akasha Series #2) by Indie Kantz. This tour will run from February 4th to 8th. Check out the tour schedule below. In Kindred we find the Damuzi twins settling into their new home with Kori Lark’s family. Desperate to keep the dangerous truth of their identity a secret, Charlie and Tirigan educate themselves on everything that was kept from them, while delving deeper into their mother’s past. In the future, Tirigan is dealing with the complicated emotions that overwhelm him after the events of Passage. In an attempt to control the situation, Tirigan turns inward and cuts himself off from those who need him most. 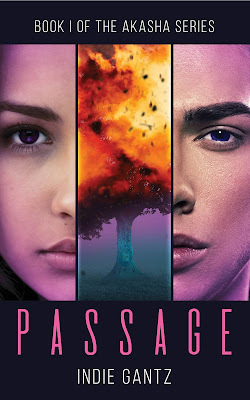 By the time Charlie and Tirigan’s timeline’s merge, a burning mystery is solved, and more than one relationship begins to unravel. The Damuzi twin’s story continues. On day one, Charlie Damuzi and her mute twin brother Tirigan are blissfully unaware of the dangerous world they live in. They may be aliens living on Earth after the extinction of humans, but to Charlie, life is pretty mundane. On day two, the Damuzi family is ripped apart by a family secret that forces the twins to flee the only home they’ve ever known. Determined to find a way to reunite their family, Charlie and Tirigan travel to uncharted territory in search of their salvation. In the future, forty days from when we first meet the Damuzi twins, Tirigan is on the move. His destination is unknown, as are the people he’s surrounded himself with, but his mission is still the same. Keep his sister safe and reunite their family. However, as Tirigan attempts to navigate the complex bonds he’s formed with his companions, he’s forced to confront the one thing in life he has yet to fully understand. Indie Gantz grew up in Northern Virginia and received her Psychology degree at George Mason University. Despite her passion and curiosity for the human mind, Indie left her chosen field of study to finally give voice to the many imagined minds she has created. Indie lives with her family in North Carolina. She spends her days drinking tea and clacking keys. Cover Reveal: Lucid by Kristy Fairlamb!